Spring Scientific Scholarship Meeting - Abstract Deadline February 23! The history of ACP as told on the national website "Celebrating 100 Years" has some fascinating highlights (www.acponline.org). Several illustrate how closely ACP has been intertwined with changes in medicine and continues to evolve - did you know that the first Leadership Day in Washington DC was held in 1993? Long before the Affordable Care Act, ACP's National Health Insurance Guidelines for Legislation were presented in 1975, followed by Decision 2000 twenty five years later for legislation on universal health insurance. MKSAP was launched in 1967 and Doctor's Dilemma/Medical Jeopardy began in 1984 (I was a 4th year med student - no, never in a team competition!) These and so many other ACP advocacy themes, innovations and resources now seem routine! A lot is happening in our chapter as we race through winter and toward our first Spring Scientific Scholarship Day to be held May 29th, 2015. We hope many residents, students and fellows-in-training will present abstracts of your research and/or quality improvement projects, with February 23rd the last day to submit. Mentors, advisors and program directors are encouraged to attend. More information can be found below. Amazingly, we are already deep in planning next year's fall chapter meeting - and still enjoying reflections of the terrific November 2014 meeting. We were able to recognize our 2014 chapter awardees, each with exceptional stories of professional dedication and contributions that are humbling and inspiring. The recipient honored for Community Service, Ann Dreyer, MD, FACP, was on a medical mission to Guatemala at the time of the meeting, and so was presented her award at a Women in Medicine dinner on January 30th. It was fun to see a sample of Ann's unique art "Creatures" designed with gourds, with all proceeds going to fund-raising as part of her 23 years of volunteer work with the AIDS Project in Snohomish County. If you ever wanted evidence that your concerns are being heard, and that ACP promotes a powerful collective voice for advocacy, I hope you read the letter about Maintenance of Certification (MOC) by Dr. Rich Baron of ABIM on February 3rd. Remarkable not only for what was said, but how it was said. MOC continues to be among ACP's highest priorities. Finally, I hope that you can attend the ACP annual meeting in Boston, which promises to be a special Centennial celebration. Each chapter was asked to nominate for Centennial Award recognition a single individual who has made exceptional impact on development and growth to the active chapter we are today. We are thrilled that our chapter nominee, Douglas Paauw, MD, MACP, was selected to receive a national ACP Centennial Award! See more about this amazing honor later in this newsletter. Getting to talk individually with many of you at our various chapter activities is a favorite part of being your governor - your energy and ideas help focus our direction. A special thanks to our committees and council members for your time, hard work and guidance! Medical students, residents and fellows-in-training are invited to submit research and QI project abstracts for the Chapter's inaugural Spring Scientific Scholarship Day to be held Friday, May 29 on the UW campus. Deadline for abstract submissions is Monday, February 23 at 11:59 PM. Click here to submit abstracts. This year's "Update in Internal Medicine 2015" meeting occurs the following day, Saturday, March 7th. The meeting will feature an update on cutting edge Hepatitis C treatments by expert Dr. Terry Box. 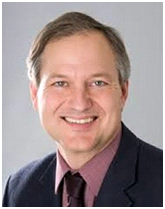 Dr. David Spach from the University of Washington will present an Infectious Disease 2015 update. Dr. Steve Mcgee, back by popular demand, will have more physical exam pearls. All in all, the SSIM meeting will be an amazing opportunity for both hospital-based and office-based internists, as well as other specialists and primary care providers, to hear a broad range of updates in areas relevant to the care of adult patients. As this year's meeting will be held on Saturday only, for those traveling to Spokane, consider making an extended weekend out of it by visiting one of the five major ski resorts (Schweitzer Mt., Silver Mt., 490 North, Mt. Spokane, Lookout Pass) within a 2 hour drive of downtown Spokane. Any questions send an email to: spokanesocietyim@gmail.com. 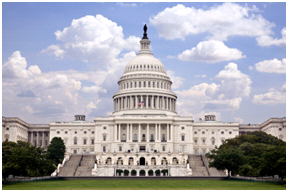 The 22nd annual ACP Leadership Day on Capitol Hill will be held May 20-21 in Washington DC. Leadership Day enables the College to increase its presence on Capitol Hill and bring our issues to the attention of U.S. lawmakers. This motivated and engaged delegation will assist the chapter greatly in our advocacy efforts. The two-day event will provide ACP members with advocacy and/or media training, an update on the College's priority legislative issues, briefings by members of Congress, administration officials, and key Capitol Hill staffers, and an opportunity to meet with your state's elected officials. Council members funded by the WA chapter to attend this year include Matt Hollon, Paul Kassab, Doug Lindahl, Hani Murad, Sundance Rogers and Cathrine Wheeler. Several residents and students will also receive chapter funding to attend Leadership Day. Carrie Horwitch and Vamsi Kanneganti will also be attending. A great delegation from our Chapter! Results of the chapter election were announced at the Annual Business Meeting on November 7, 2014. Mark Beiter DO FACP (Seattle; Chair of Early Career Physicians Committee), Jeff Clarke MD FACP (Wenatchee) and Doug Lindahl DO FACP (Shelton) were re-elected to serve an additional two year term on the Executive Council. Rebecca Ruud MD FACP is returning as Secretary/Treasurer for 2014-2015. Congratulations to Paul Kassab MD FACP (Seattle), Jennifer Mills MD FACP (Bellevue), Hani Murad MD FACP (Kennewick), Flint Orr MD FACP (Prosser) and Julie Silverman MD (Seattle), elected to serve two-year terms on the chapter's Executive Council. Click here to learn more about these new council members. In addition, we would like to thank departing council members Lisa Chiou, DC Dugdale, and Saleem Memon for all their hard work on behalf of the chapter. Dr. Chiou was 2012 Annual Meeting Co-Chair and Hospitalist Committee Co-Chair 2012-2014; Dr. Dugdale co-chaired the Awards Committee 2010-2014 and Dr. Memon was Membership Committee Co-Chair 2013-2014. A major focus of our chapter service is to conduct a superb annual meeting that connects, informs and energizes members of all career phases. To do justice to everyone who contributed to the outstanding November 2014 chapter meeting, we should acknowledge every speaker, abstract presenter, and the entire agenda! I'm so proud and grateful to Jen Mills, MD, FACP, and Kim O'Connor, MD, FACP for their creative and tireless work all year as Co-Chairs with the Planning Committee. ACP has compiled the evaluations, and commended the successful meeting with an exceptional overall rating of 4.6/5 (5= highest) and uniformly superb individual sessions. Evaluation comments and suggestions for future content are being carefully assessed. The highest-rated Mentoring Breakfast was a multi-faceted event of small group career mentorship - and of course, career mentoring will be a theme of our Spring Scientific Scholarship Day. 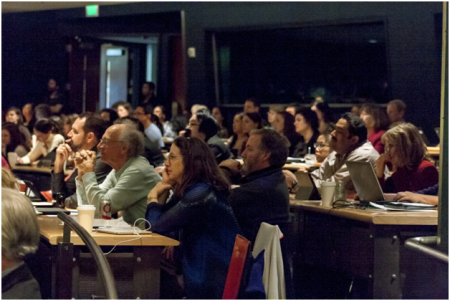 Scientific sessions were well-attended and well-received. Each year, the Washington Chapter ACP honors internists for their contributions to patient care, community service, and education. 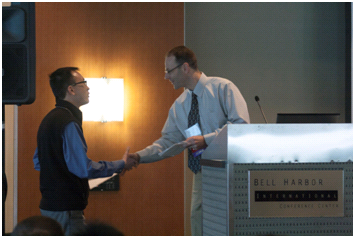 The following 2014 awards were presented at the Washington-ACP Annual Scientific Meeting in November. Read more about the 2014 award recipients here. 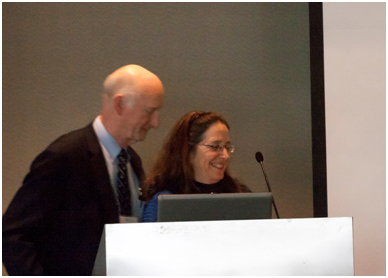 The 2014 recipient of the Laureate Award from the Washington Chapter of the ACP is Carrie Horwitch MD, FACP. She is the immediate past Governor of our Chapter and currently serves on the ACP Board of Regents. Associate Program Director for the Internal Medicine Residency at Virginia Mason Medical Center in 1999, Dr. Horwitch is an outpatient primary care physician, HIV care specialist and key faculty for graduate medical education. She recently published a book of limericks. 2014 Internist of the Year James D. Bales Jr., MD, FACP was born and raised in Searcy, Arkansas where his father was a university professor. Board certified in Internal Medicine, Infectious Diseases and Preventive Medicine, he also holds a master's degree in Clinical Tropical Medicine from the London School of Medicine Hygiene and Tropical Medicine. A retired U.S. army colonel, Dr. Bales joined the Madigan Army Medical team in his current position in 2007. Doug Lindahl presenting the Internist of the Year award to James Bales Jr. 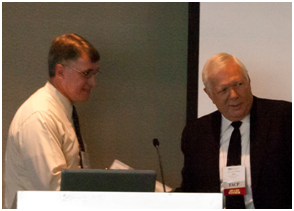 The chapter's choice for the 2014 Golden Apple Award is LTC George Mount, MD, FACP. Dr. Mount is a rheumatologist who teaches and sees patients at Madigan Army Medical Center in Tacoma. He is associate program director for the internal medicine residency program and chief of the rheumatology service and regularly mentors and teaches students in his clinic and as a clerkship preceptor. 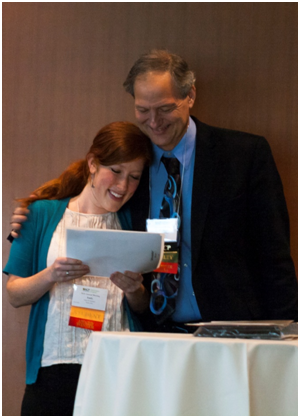 The 2014 Douglas S. Paauw Outstanding Medical Student Award is Emily Cedarbaum, MPH. A fourth-year medical student currently applying for a residency in Internal Medicine, Emily recently completed her Master of Public Health degree with a thesis focused on young heroin users in the Seattle area. She looks forward to traveling to Uganda for a clinical elective in 2015. Community Service Award recipient Ann Dreyer, MD, FACP has worked her entire career with the Everett Clinic in primary care at the Harbour Pointe (Mukilteo) satellite location, providing inpatient care for her practice with a special interest in HIV care. Dr. Dreyer has been on the regional planning council for HIV/AIDS and most recently, the WA state steering committee. A volunteer board member since the inception of AIDS Project Snohomish County (APSC) in 1992, Dr. Dreyer has organized and participated in many of the fund-raising and other events for the organization. Resident competitions at the 2014 chapter meeting included oral presentations, poster presentations and the always-popular Medical Jeopardy match. Students participated in a poster presentation competition. We were lucky to have the opportunity to learn from our colleagues-in-training. 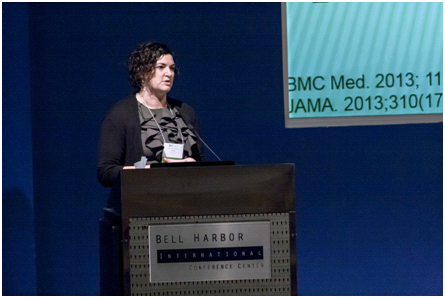 Rachel Safran, MD, Providence Spokane resident, won the oral presentation competition with her talk entitled Testosterone Supplements: Hardly a Stroke of Genius. Dr. Safran was awarded a trip to the National ACP meeting in Boston to be held April-May 2015. Resident Rachel Safran (Providence Spokane) won the resident oral presentation and a trip to the ACP Spring Meeting in Boston. CPT Victoria F. Sullivan, MD (MAMC) won $750 for the outstanding resident poster entitled Achalasia Leading to Acute Respiratory Failure. University of Washington residents (Drs. 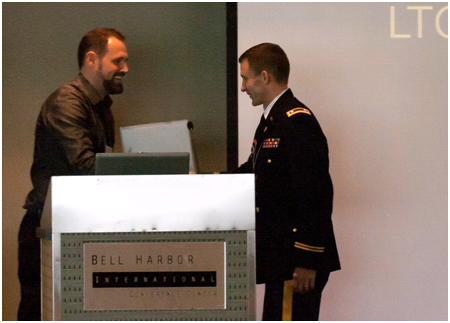 Brian Bechtold, Eric LaMotte and April Schachtel) prevailed over teams from Providence Spokane, Virginia Mason, and Madigan Army Medical Center to win a trip to the National ACP Doctor's Dilemma competition in Boston, April 30-May 2, 2015. If you attend the national meeting, please take the time to cheer on our Washington State team! 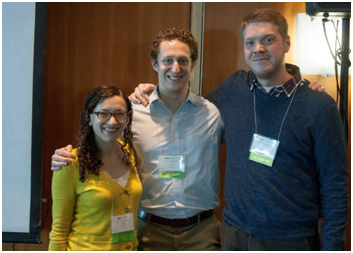 UW residents April Schachtel, Eric LaMotte, Brian Bechtold will compete against other Doctor's Dilemma/Resident Jeopardy teams at the ACP Internal Medicine Meeting in Boston. Click here for more Jeopardy photos. University of Washington medical student Huat Chye Lim won $250 in the student poster competition for Sleep Well: A Retrospective Database Analysis of Patient Risk Stratification, Clinical Deterioration and Vital Sign Collection Frequency at an Academic Medical Center. We are pleased to announce that our chapter is in receipt of the 2014 Chapter Excellence Award! The award recognizes chapters which successfully meet the ACP national standards for managing a chapter. In order to achieve the Chapter Excellence Award, chapters must meet all basic criteria and seven optional criteria. Criteria include such activities as formulating an effective Governor's Council and committees, communicating frequently with membership, providing educational opportunities, recruiting and advancing members and celebrating membership through local awards. Thanks to those chapter members who were part of these endeavors! Your hard work and dedication is the reason we received this award. Founded in 1915 to promote the science and practice of medicine, ACP is the largest medical specialty organization and second-largest physician group in the United States after the AMA. More information about Dr. Paauw and this award can be found here. We're off to a promising start this year as we held our first membership conference call on January 19. The purpose of the meeting was to engage our new and regional council members in a discussion about how to reach out to recruit and retain members in our chapter, including those residing outside greater Seattle, medical subspecialists, academic internists, and also bridge the gap of residents and fellows to early career physician members. Matt Hollon (Spokane), Hani Murad (Tri-Cities), and Flint Orr (Yakima) joined Seattle area council members and representatives Mark Beiter, Paul Kassab, Bob Thong, chapter governor Joyce Wipf and me. Also participating were Gary Forbes from Port Townsend and Oren Fix, a hepatologist who moved back to Seattle from UCSF where he had served on the membership committee for the Northern California chapter. As a council, we do want to support the other areas of the state but need some grassroots effort. The next calls will attempt to focus on members farther west on the Olympic peninsula and SW Washington and Pullman with the potential for collaboration with the Oregon and Idaho chapters. If you are in any of these locals, please contact me at nakabayashimd@gmail.com with comments and any ideas for supporting your area. The 2015 ACP Washington Chapter Scientific Session will be held Friday and Saturday, November 6- 7, at the Bell Harbor Conference Center in Seattle. Half-day pre-courses and MOC Modules will be held at the same venue on Thursday, November 5. Be sure to mark your calendar. We look forward to seeing you! The Washington Chapter regularly sends messages about its programs and services of interest to members. The Chapter has contracted with Constant Contact to facilitate this service. ACP respects your privacy and will not sell or lease, or share your email address with any organization except for the purpose of communicating with members about Chapter business.